Amie, which means “friend” in French is truly “your skin’s best friend” and is an award-winning natural beauty line that you may have walked past during your recent trip to Shoppers Drug Mart. This skin care and beauty range is perfect for those with sensitive skin and is a natural way to achieve perfect, flawless skin. Each product is formulated with plant and botanical extracts and free of any harsh chemicals, parabens, sulphates, mineral oils, petrochemicals, animal extracts and are suitable for vegetarians and vegans. Although these products are super gentle on the skin, each product is super effective and is designed to work in complete harmony with your skin. It helps to keep it clear, soft and radiant, no matter what your skin concerns are. Whether you suffer from oily and prone to breakout skin or dry and dehydrated skin, there’s a product that’s suited for you. Amie beauty line is perfect for those that want affordable, accessible and effective products to not only help cleanse their skin, but keep their skin moisturized and hydrated using natural ingredients with no harsh and irritating chemicals found in other brands. Each product can be found at your local Shoppers Drug Mart across Canada. Amie Morning Light Hydrating Daily Moisturiser features the perfect blend of natural extracts, such as rosa canina fruit oil, rosa centifolia flower extract and malva sylvestris extract which helps to lock in moisture and reduce dryness, conditions and tones the skin, soothes irritated skin, along with keeping it silky smooth and soft. It has a lightweight and creamy texture that absorbs quickly into the skin without feeling sticky, greasy or oily. It’s gentle enough to use both day and night and is perfect for those who suffer from dry and dehydrated skin, as it keeps skin moisturized the entire day. It has the refreshing and floral scents of roses that awakens the senses in the morning. It retails for $12 for 100ml. Amie Radiant Dawn Exfoliating Daily Wash features green apples, lemon extracts, blueberry seeds, vitamin E bursting beads to help unblock pores, lift away dead skin cells, dirt and oil and help tone skin for an overall even complexion. It has a light green formula with tiny micro beads (which are actually the blueberry seeds) that gently exfoliate the skin. It’s gentle enough to use daily, but abrasive enough to deeply exfoliate for cleaner, more radiant looking skin. It does an excellent job at clearing out the pores and keeping the breakouts at bay. Simply wet face and massage a small dime size amount into the skin using circular motion. It instantly transforms into a soft foam and washes clean away with warm water. You’re left with just a hint of refreshing green apple left behind. It retails for $12 for 150ml. Amie Spring Clean Deep Cleansing Mask helps purify pores, combats oily skin and fights blemishes with its gentle, yet effective formula. It’s bursting with high-quality natural plant extracts like organic peppermint, white clay and lime butter. This deep-cleansing treatment works pore-deep to help draw out dirt, oil and impurities while soaking up excess oil and prevent breakouts. It has a rich and creamy, pale mint texture that’s easy to apply using only your fingertips. Simply apply a thick layer over your entire face, sit back and relax. Since it is a clay mask, it will somewhat harden, but doesn’t fully dry like other masks. I enjoy this, as it doesn’t give you that tightening and drying effect and it’s also a lot easier to remove. You can leave it on for as long as you like, at least 10 minutes to get its full effect and then simply just wash clean away with warm water. It has a refreshing and cooling effect that lasts the entire time the mask is on, but does give off somewhat of a menthol vapour effect that could irritate the eyes. It has a refreshing scent of peppermint scent that reminds me of the holidays, perfect for this time of year. Skin is instantly smoother, softer and highly hydrated and is safe enough to use several times a week. It’s a great mask for only $12. 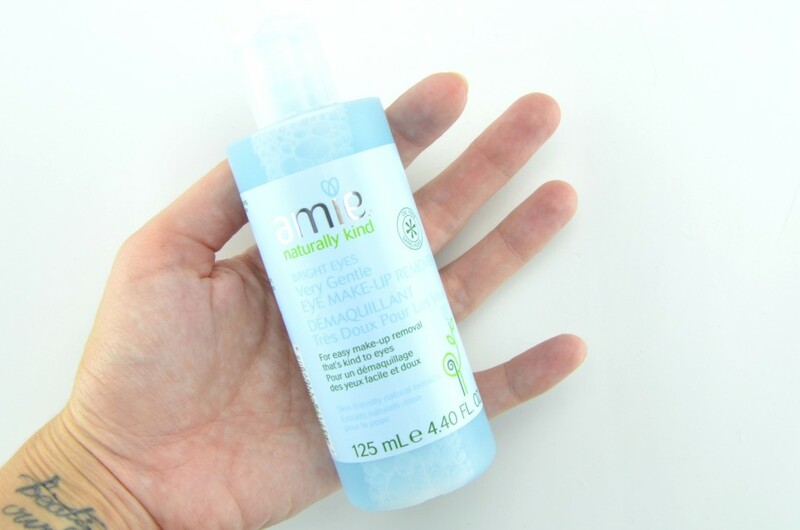 Amie Bright Eyes Very Gentle Eye Makeup Remover gently and effortlessly removes make-up, even waterproof mascara without stinging or irritating the delicate eye area. It’s 100% oil-free to ensure a non-greasy after-feel and is formulated with meadow cornflower, chamomile, grape water and cucumber to help soothe, decongest, cleanse, cool, hydrate and refresh the skin. It has a liquid formula that can be poured over a cotton ball or pad before gently sweeping over closed eyelid. It does a wonderful job at removing powder and cream eyeshadow along with mascara and eyeliner. It does leave a little waterproof mascara under my eyes, which is to be expected. It actually keeps my eyelids and delicate eye area fairly moisturized. It retails for $12 for 125ml.